How are you on this Friday? I am so happy to have the day off. We were pretty lucky because we were suppose to work, but our boss was nice enough to let us have a long weekend! Woohoo!! I love unplanned surprises like that! Today I have for you a simple summertime recipe that you can whip up in a matter of minutes, just takes a little bit of cutting time. This is my Watermelon Salsa! I happened to have two watermelons on the counter and I just needed to use them up, so I debated on what to make? Hmmmm… The night I decided to use the watermelon, I was making my Yogurt Marinated Grilled Chicken that I posted yesterday and I thought how can chicken and watermelon go together? A marinade would not work out, and then I saw some tortilla chips on the counter and thought salsa! Perfect!! 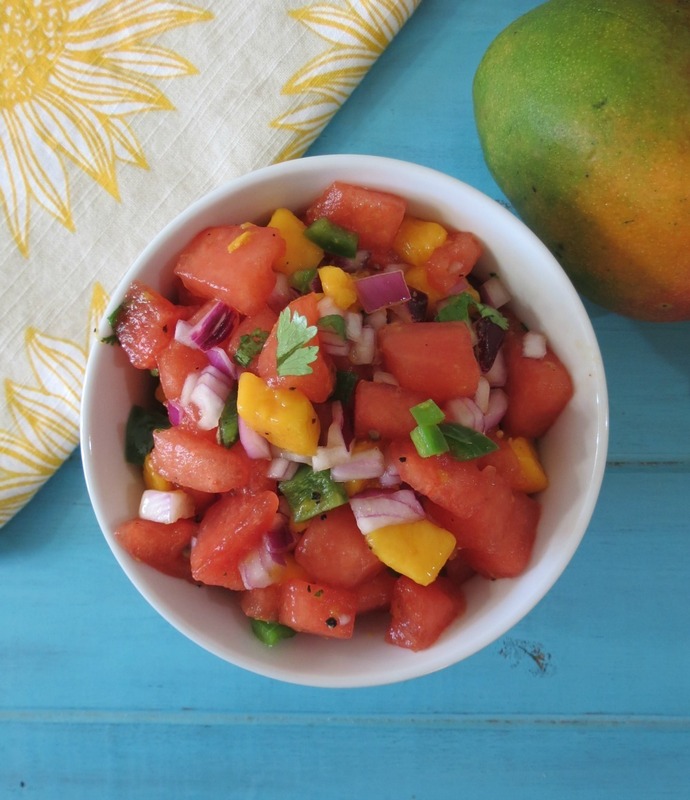 This recipe is adapted from my mango salsa with the addition of watermelon. It turned out fantastic!! The salsa is more sweet than spicy, but with the onions and jalapenos it does add a nice kick of heat. I placed this on the table with dinner and my Husband didn’t touch it. He likes all the ingredients, so I made him try it. He took a small and I mean small spoonful and said wow, this is good! He said the combination is weird, yet it all goes together. He didn’t put it on his chicken, but used it as a side dish! Yah! Glad he liked it!!! 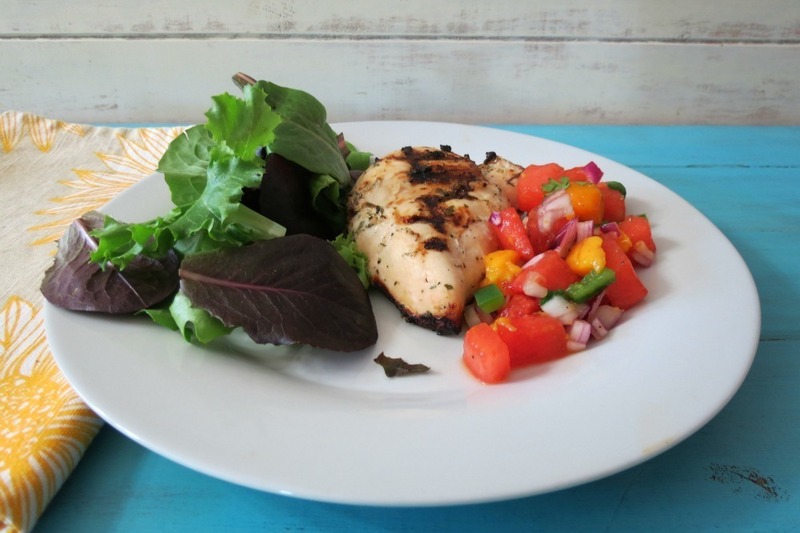 It is really a fantastic little salsa and goes perfect with chicken! I also had some leftovers so I placed it on a bed of mixed greens and took it to lunch the next day. It tasted just as good the next day as it did the day I made it. Even though you don’t see it in the picture, I did serve my dinner with a side of steamed broccoli. Nothing to fancy! This dinner, was light, tropical and perfect for a hot summers evening. All I needed was Skinny Margarita to go with it! Sigh…. Darn, why didn’t I think of that then? I always get my best ideas when I’m writing! 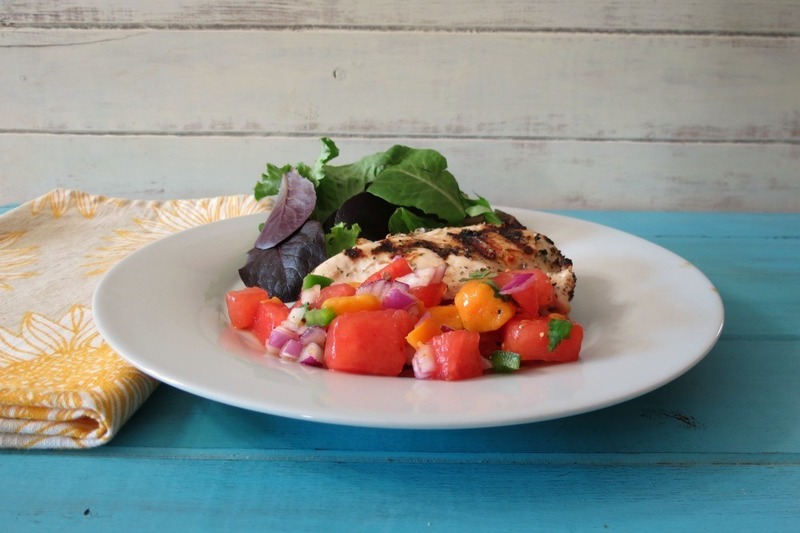 A sweet, summery salsa with a slight kick of heat that goes perfect with chicken or simply for scooping chips in it. In a bowl, add all of your ingredients, mix well. Refrigerate until ready to use. Note: When cutting the jalapeno, be sure to wear gloves. This recipes is completely guilt-free and goes perfect with chicken, shrimp or topping on tacos! Or simply dip some tortilla chips in it or have like my Husband did, as a side dish. I am looking at my counter right now and I have lots more fruits to use. I’m wondering if I can come up with another kind of salsa. I really love salsa and I am never out of it! You should see my fridge! I have about three different kind of salsas from Trader Joe’s and I have some from MiPuablos Mexican Market, plus my homemade stuff. I use it not only for topping on chicken, but works great as substitute for salad dressing, that adds a lot of flavor and not a lot of calories! Well have a super great weekend! Tomorrow I have my first Major League Baseball game to go to and I can’t wait. It’s the San Francisco Giants against the Los Angeles Dodgers. I’m not much of a baseball fan, but I do love the excitement of a good game! Plus, it’s going to be my cheat meal this week, because I need to share some ball park nachos with my Husband! I know I’m being bad!! But it’s a baseball game and I have to have nachos at a game!! Pretty sure I could just eat this on its own! Looks delicious and refreshing! Enjoy your long weekend!! Thanks Marie! I ate it on it’s own! I just love watermelon! 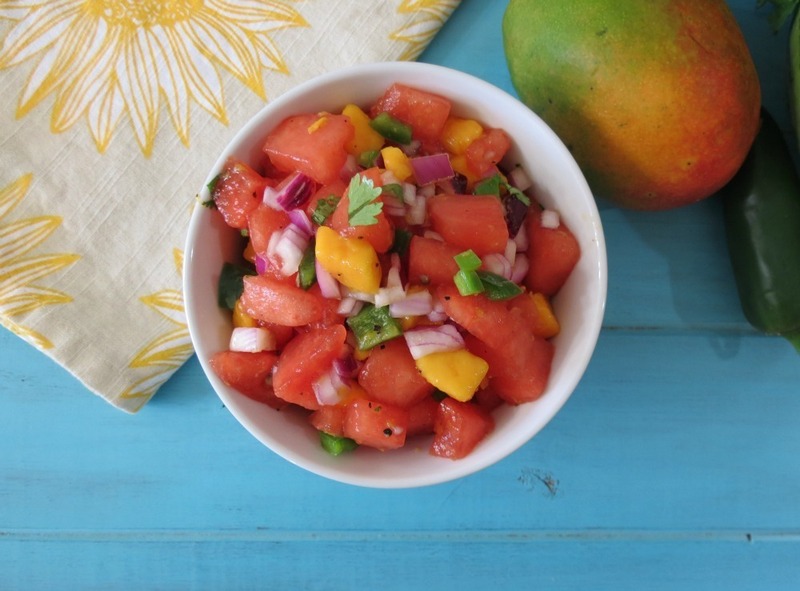 I love mango salsa but never thought about adding watermelon. I bet it’s wonderful! Thank you for sharing this recipe, and I hope you will consider linking up with me for my Foodie Friday Blog Hop on A Room for Two with a View. Feel free to share as many recipes as you’d like. I know my readers will love it! Ohhh, I haven’t had spiked watermelon in years! Sounds so good and refreshing, must have been perfect for celebrating the 4th! 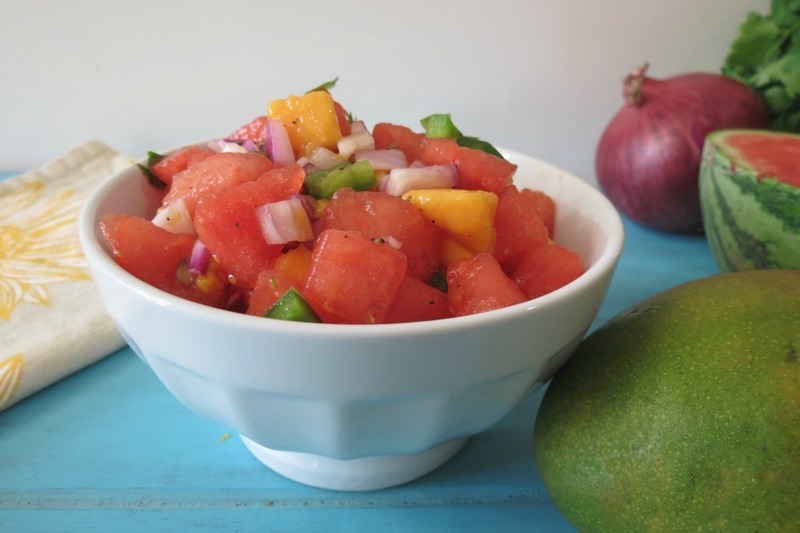 I have never tried watermelon in a salsa! This is so colorful and fresh looking and would be great on chicken or fish! Found you somehow through someone on Google+ – this looks delicious, Jennifer! 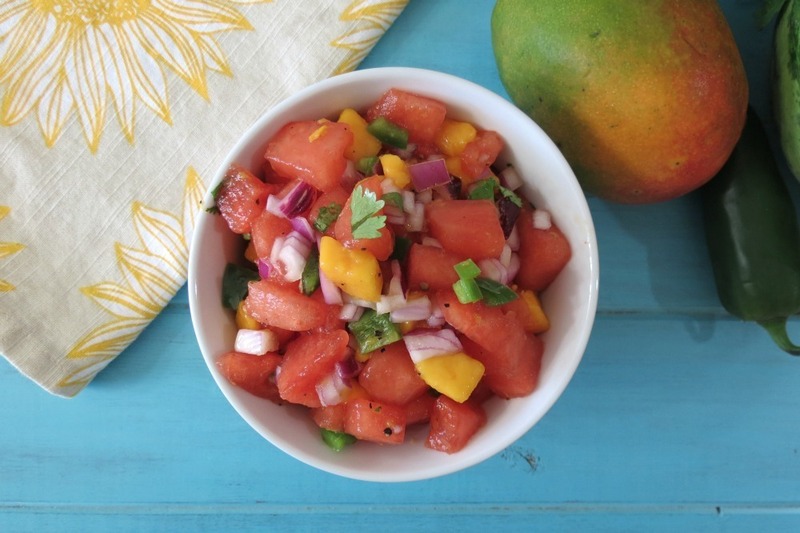 Love fresh salsa’s – will definitely give this a try! Glad you found me! 🙂 Thank you for the nice comment!